Are you ready for this entirely unpredictable crime fiction/ thriller? I DON’T THINK SO! 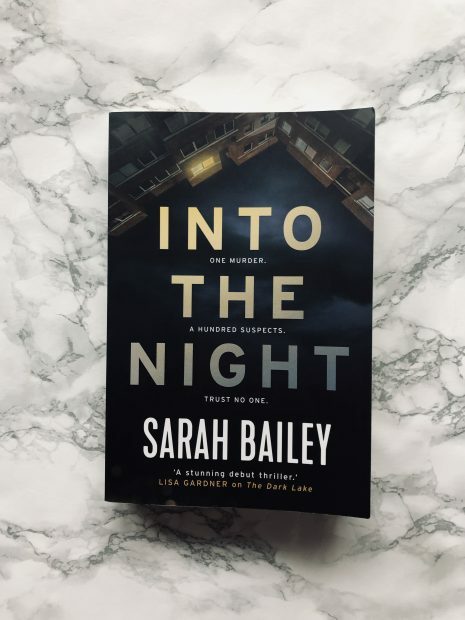 But get ready for it, because it’s a good’un… Into the Night by Sarah Bailey. With the whole thing caught from multiple angles, how hard can it be to catch the crazed culprit? And who would want to hurt Australia’s adored boy-next-door? The whole concept is very clever! Into the Night is more of a slow-burner but persevere and you will be rewarded! Whilst it is very detailed and covers a range of themes, I really enjoyed this depth – you understand the true battles when solving a crime, and not just the ‘eureka’ moment which most books solely focus on; it gives a much more hearty impression into the investigation and police procedurals, but also the effect on those surrounding the case. The whole concept is very clever! It had many characters, so occasionally slightly hard to keep up with. There was also quite a lot going on, with two cases from the get-go and then this one, but I guess there’s no rest for the wicked/ Melbourne detectives! There was one very small part I didn’t like because it was just toooooo convenient and common, but other than that, a thoroughly enjoyable read which will keep you gripped from the start! I also thought the first chapter was badly placed – you were either asking questions or guessing whether it was intertwined with the story. But on that note, Into the Night was entirely unpredictable. I had my fair share of predictions throughout, but my little detective mind couldn’t predict the ending. There were a few rambly moments where parts were repeated (as you can imagine with an in-depth crime fiction), but I feel like every sentence was well thought-through and there wasn’t a stone left unturned. Genre wise, I’m not sure whether I’d market Into the Night as a thriller. The last 50/60 pages got super intense and definitely thrilling (I thought my head was going to explode at one point), but the whole way through you get a crime fiction and police procedural vibe. Bailey has a way of making you feel like a fly on a wall – I’ve never been to Australia, so I thought it’d be quite hard to envision, but the author has really nailed the descriptive side. I honestly can’t praise the writing or concept any higher. 11/10 job there, Bailey. And that last paragraph? I’m heckin’ READY. This is the second book which features the protagonist, the first being The Dark Lake by Sarah Bailey, which I’ll totally be picking up soon. Note: this would be a fabulous film!